The big story from the first preseason game Thursday night was clearly the tremendous pressure the Eagles got from the defensive line. I’m not sure that the front four caused as much chaos in the backfield during any quarter last season as they did in the first 15 minutes last night. If the Eagles can bring that same pass rush to bear during the regular season, Jim Washburn will rightfully be lauded (as he already is). Still, I have to throw a little cold water on the unnatural optimism (for Eagles fans). First of all, the usual caveats apply: we saw less than a quarter of action from the starters, which is generally predictive of squat. But perhaps more importantly, the Baltimore offensive line has almost as many dead bodies as you’d see on the streets of The Wire. 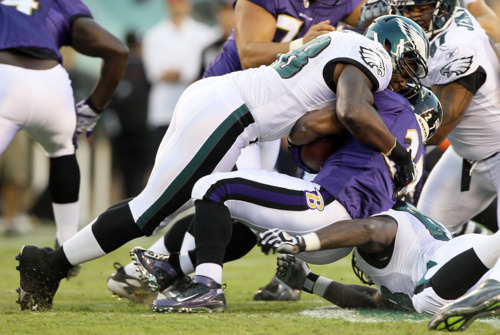 The Ravens line already ranked 25th in pass protection in 2010 according to Football Outsiders. And now they have new starters at right guard and right tackle. In short, I couldn’t have expected much more from the Eagles defensive line last night. But let’s watch at least a few more preseason games before we crown them. I thought the most impressive thing about Michael Vick’s series was how good he made the starting trio of Jason Avant, Riley Cooper, and Chad Hall look. The best quarterbacks in the league raise the play of average wideouts (see Manning, Peyton and Brady, Tom). Maybe we shouldn’t worry too much about Jeremy Maclin’s injuries. Also, staying in the pocket and threading the needle for the touchdown pass to Brent Celek on the Eagles’ first red zone appearance of the year was sublime . Vince Young looked like Vince Young. He’s a less accurate, less steady version of Michael Vick. But almost as elusive with his legs. Wished we could have gotten more looks at the first team linebackers and offensive linemen. Both units were question marks for me before the game and I didn’t see enough to answer anything. File this under a positive start for the revamped, all star defensive backfield: the Ravens didn’t complete a pass to a wide receiver until almost 25 minutes into the game. Tagged with Philadelphia Eagles, Baltimore Ravens, Preseason, Game, Defensive Line, Jim Washburn, Sacks, Pressure, Pass Rush, Michael Vick, Wide Receivers, Vince Young, Kickoffs, Touchbacks. August 12, 2011 by Brian Solomon.